This portfolio is a record of many of the projects I've worked on. There's a few individual ones there, but I've been very lucky to be involved in some great teams over time, either as a participant or a lead. Thanks to all my various collaborators represented here. I remember trying to make the damn robot go down the hallway in the computer science department without crashing into the filing cabinets (shiny and black and spectacularly invisible to both the infra-red and ultrasound sensors we had). The ticking noises from the ultrasound (and the crashing into the filing cabinets) tended to disturb the professors. One time we asked John McCarthy if he was interested in the robots. He said "I'll be interested in the robot when the robot is interested in me!" 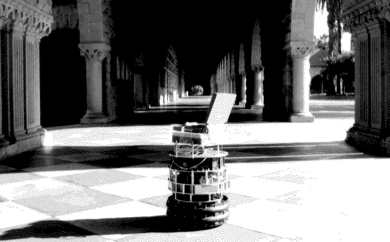 Eventually we got a cooler robot with a laser, and robotic-sounding speech synthesis. Some of us worked one summer to make SCIMMER ("Sarah, Craig, Illah and Marko's Most Excellent Robot") and enter a contest held in the sweltering Washington heat at the AAAI-93 conference. The task was to escape a cluttered office at high speed. The late nights of coding were mostly spent trying to get the speech synthesiser to make embarrassing noises, which duly happened when we won the contest. At least one of the team grew up and is now a proper robotics professor. My memory is far from perfect, and both the web and tech companies change so fast that even the recent projects here are sometimes hard to track down, so I apologise now for whatever or whoever I missed. Please send me any corrections.